L'Euromax est ce qu'il y a de plus près d'une fournaise à granules. Il est muni d'une trémie d'une capacité de 125 livres. Son contrôle ACL dernier cri vous permet de choisir parmi diverses configurations d'une simple pression du doigt. La technologie d'alimentation «bottom-feed» utilisée à l'intérieur de l'Euromax réduit au minimum l'entretien du pot de combustion tout en permettant une combustion plus complète et plus efficace. Accessible, intelligent, élégant et propre! Définitivement le mode de chauffage du 21ème siècle. 85 % des 35 derniers propriétaires ayant enregistré leur garantie se disent satisfaits du produit. Diamètre de la buse de raccordement 4"
Surface vitrée – dimensions (Largeur X Hauteur) 14" X 8 1/2"
Dimension hors-tout (Hauteur) 41 1/4"
Dimension hors-tout (Largeur) 24 5/8"
The Euromax replaced a 33 year old woodstove. We were tired of storing and burning firewood. 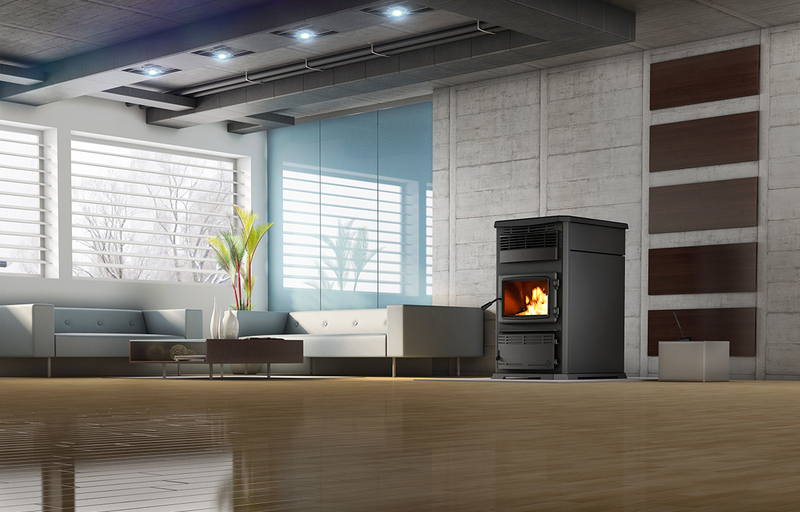 This pellet stove is much more efficient and more attractive than the woodstove and has the output needed to heat our four bedroom, two story home. Jim at Papa Bear is very knowledgeable of pellet stove set-up and operations. We feel confident that Papa Bear will provide all the support we need in order to enjoy the new Euromax. Jim at Papa Bear Stoves in Marathon provided excellent service to me and my family when our old pellet stove went on the fritz. In the middle of winter with a winter storm imminent he went out of his way to get this unit in stock and delivered to us in a timely fashion. Without his help we had no heat for our approx. 2400 square foot home. The Euromax replaced a 15 year old pellet heater and is slightly larger than the old unit, the difference in efficiency has already proved itself in the 2 weeks we have owned it. It looks great and is a dream to maintain compared to the old unit, no little screws in order to access the blowers and cleaning ports. This should last us for many years to come. Thanks Jim and Euromax for a quality product!